Disclosure: I received two outfits and snowballs for review from Chasing Fireflies. All opinions are my own. Can you believe that Christmas is merely a month away? It's the time to break out the camera and get your kids in their holiday best for photos. Kenzie loves to dress up in fancy dresses and I thought it would be awesome for Mason to rock a suit for the holidays now that he is a full on toddler. I've seen the adorable costumes that Chasing Fireflies offers but when I saw the outfits in the All Dressed Up category, I was giddy. 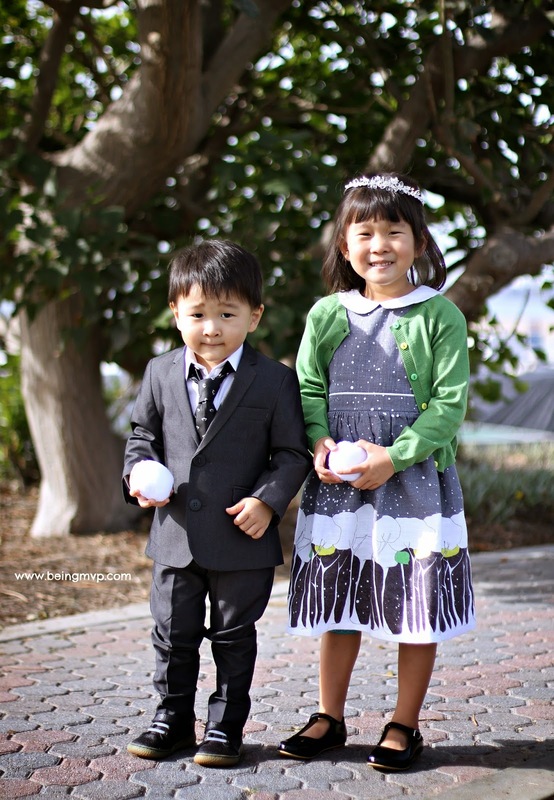 Little kids looking precious and dapper in holiday best - what more can you ask for? They offer head-to-toe outfit suggestions which is really nice if you don't know where to begin in your search. My dear Kenzie is pretty in her Snowstorm Dress which is accompanied by a book. I love the subtle holiday design with the trees and snow. When it becomes chilly, just toss on the coordinating green cardigan. I'd love it in my size! The black patent Mary Janes are classic and complete the outfit. Kenzie exclaimed that they look like tap shoes and began tapping all over the place. *Note that she has never taken tap before so I have no clue where she came up with that. Kenzie sure loves dressing up like the princess she is so to top off her holiday outfit, she is wearing the girls crystal tiara. This is really exquisite for little girls - almost like my wedding tiara. I just used bobby pins to adhere to her hair and she was ready to pose. Sparkly and can be worn any day of the week for a little glam. Mason is a handsome tot in the Mod Suit. He was a meaty baby but has now grown into a tall, lean toddler. This is one sleek suit with impeccable detailing. The cut is slim and fits Mason quite well. With a white dress shirt and the Monkey Business tie, Mason looked like a handsome little man. I thought he may be uncomfortable but he was running around and playing with ease. Hmmm.. does that mean he could potentially grow up to be in the corporate world and look GQ all the time? A mom can only hope. Although it has been a wee bit chilly in the mornings and evenings, the daytime highs still reach into the high 80s here in So Cal. So even though I would have loved the background for photos to be changing leaves with wind blown hair, alas we had to settle for the beach. I had the setup thought out in my head but the afternoon didn't go quite as planned. Taking photos of young kids means just going with the flow and chasing them while snapping away. The Snowtime Snowballs didn't quite make it into the air to imitate snow falling as Hubs kept tossing them to random areas and the kids kept on chasing them down instead of looking perfectly straight at the lens while the snow fell around them. We'll need to get a bit of practice in on that! What I've learned over the several years of being a mom is to cherish all the moments captured in time rather than just posed. Kenzie loves her dress and I can't wait for her to wear it on her birthday - Christmas morning! Chasing Fireflies has a fabulous selection of boys suits & coats, girls dresses & sets and holiday decorations for your kids holiday photo shoot. Do you dress your kids up during the holidays? What do you think about the gorgeous pieces at Chasing Fireflies? I am so in love with those outfits! I just got my kids some Chasing firefly dressup clothes for Christmas and I can't wait to get pictures of them in them! I just adore the styles. And your kiddos are so stinking cute! I just love it! They are so adorable! Great pictures. Your kids look so great! Chasing Fireflies has such cute clothes. Cute, cute, cute. Double cute! These are great pictures. I love your daughter's dress. These are so pretty! The border on that dress is gorgeous, and you took some great pictures. So cute, love the clothes! That dress especially is darling!! These photos are the cutest! I need to get some cute photos of my munchkin like this. Oh my goodness, those outfits are adorable! Not to mention, your little models are adorable as well! I need to get some updated family pictures done! They are seriously adorable. I love the beautiful dress and the handsome suit. I am going to have to check out the shop and see what I can get my own kids! You have really beautiful kids. I have two daughters and 1 son and my daughters are complete opposites. One loves to dress girly and the other prefers t-shirts and jeans. Plus, athletic shoes. hahaa! How cute are your kids! Their outfits are to die for, I am loving both choices that you made! Your kids are so gorgeous. The photos are wonderful and will make a wonderful memory for years to come. I absolutely LOVE her dress! Both of them look so adorable! Wonderful pictures! Your children are just too cute, and they have on some really nice clothes. I adore that dress. Great photos! Beautiful photos! We need to capture these moments while they're young! Love the pictures! Their outfits are super cute! The outfits your little one's are wearing are so cute and the photos are gorgeous! I love Chasing Fireflies. I just wish their clothing were a bit more affordable.